Crankies seem very straightforward right? Not! I feel like a could write a book about all the things that have malfunctioned or gone wrong during a performance! One of my favorite stories, of other people's misfortunes, comes from my good friend Dejah Leger. She was getting ready to do a school show when one of the spools broke. 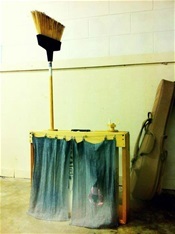 She was able to find a broom in the janitor's closet and used that as a spool. Well I tried to do my first, and its premiere was a disaster! The paper kept catching on the inside, tore to pieces and almost caught on fire from the candles! (As was wisely said in a Bugs Bunny cartoon.. a spectacular finish but you can only do it once). Does anyone have any ideas on how to stop the scroll from creeping up and down the spools? I am out of ideas.. thanks! 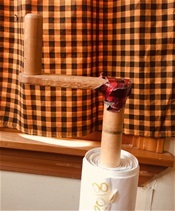 This was one of my earlier scrolls and I can see, when I line it up on a table, that the top and bottom is not straight. Whenever Podorythmie performs it, Julia Derby: crankist, has to fight with it in certain sections because it will start going south. This is because I didn't stitch the sections together straight. Lesson learned. Fabric Scrolls are more likely to travel downwards. The crankist can sit behind the crankie box to keep an eye on the scroll. If the scroll begins traveling downward you can reach into the box (while you are cranking) and with your other hand give the top of the scroll a tug upwards to get it back on track. Fabric scrolls are more likely to droop in the middle, this is gravity at work. If the crankist is cranking from behind the box, he/she can have one hand on each crank to increase the tension so that the scroll does not droop. If the scroll is traveling upwards you can release the tension (stop cranking) for a second and let the the scroll drop back down, then continue cranking. This strategy works for paper or Tyvek scrolls, it wouldn't work for fabric scrolls. Adding a disk to the bottom of the spindle gives the scroll a place to sit. This is especially helpful if you have a fabric scroll. How to prevent a paper scroll from tearing is second most frequently asked question. If you are using Tyvek or fabric for the scroll, tearing is not an issue. If you use paper, then it might be a problem. It depends on the box and who is doing the cranking and other factors such as the thickness of paper. If you are using inexpensive craft paper from a roll or thin butcher paper, you can make it stronger by covering the front (after you have illustrated it) with strips of clear contact paper. This tip comes from Dejah Leger. The strips can be around 4 inches wide and they should overlap a tiny bit. I will post a photo of this. This website is a great resource of information about gluing. The third most common question is what kind of glue to use. The type of glue you use depends on what you are gluing to what. 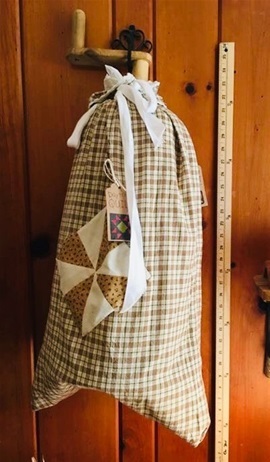 Crankie artist Felicia Cooper shared this great website with me: thistothat.com. Use that as a resource. I use Aqua glue to glue Tyvek images to a Tyvek scroll. I started using that three years ago and the images have stayed put. Modge Podge is a decoupage medium, all-in-one glue. It's great for decoupage but not for glueing images to the crankie scroll. You need a glue that remains flexible over time. A glue that does not mind being wound up tight on a dowel rod and then six months later being unrolled flat. Modge Podge may work fine at first, but it does not remain flexible over the years. I have witnessed this. Imagine hundreds of little pieces of modge podge cracking and flaking off the scroll as it is being cranked. Trust me on this. 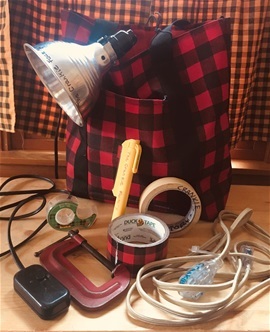 These are some of the things I take a long in my crankie gig bag. Clamp light with a spare light bulb. Dimmer switch - the clamp light cord plugs into it. You can increase or decrease the lighting, very useful! Extension cord because the clamp light cord may not reach the outlet. C-clamp in case I need to clamp the crankie box to the table. I don't want the box sliding around on the table when I am cranking it. Special buffalo plaid duck tape saved the day. Duck tape - good for emergencies, don't leave home without it! 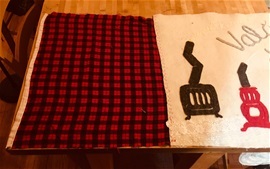 I happened to find some red and black buffalo plaid so I had to buy it. I fixed a spool once with duct tape. In the middle of a crankie performance, Julia Derby kept cranking but the spool had stopped turning. The screw hole in the dowel had stripped. Luckly it was near the end of the scroll and she finished cranking it by moving the disk at the bottom of the spool. We were able to fix it right away with duct tape. I kind of like the look. Clear Scotch tape. If you have images glued on the scroll, they might want to pop off. 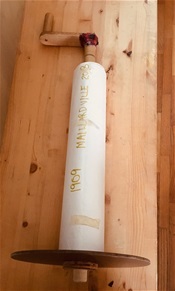 This is one scroll dressed up and ready to go out to a show. Once, when I was getting packed for a performance, I had several felt scrolls wound up on their spools, lined up by the door, next to Tiger's water bowl. Of course, his water bowl was full and the end of one of the scrolls came untaped and fell into the bowl. The felt scroll sucked up the whole bowl of water! When I started packing the car and discovered this - OMG! I took a bunch of towels with me and was able to get some of the water out but when it was time to perform, the scroll was still wet. Amazingly, it cranked OK. Since then, when out and about, I put the scroll in a plastic bag, then I put a cloth bag over it. And, don't let anyone set a drink on top of the crankie box when the scroll is in the box! Podorythmie spent two days at the Vancouver Folk Music Festival, giving crankie workshops and performances. The crankie wagons saved us! 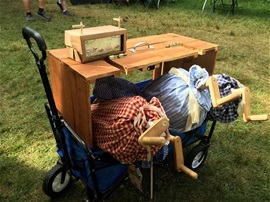 A few years ago, I saw Dejah Leger come into the green room of the NW Folklife Festival pulling a wagon with her crankie box and all her gear inside. WHOA! I was using a luggage cart, trying to bungy the box to it and it was miserable. The very next week I got one of these collapsable wagons. My crankie box fit inside perfectly. Some of the festival sites are huge and this crankie wagon has been a god-send. And, if it is raining, like it occasionally does in the Pacific NW , I can put a tarp over it and bungy the tarp to the wagon. A real covered wagon!